Way back in 2009, Kellogg Company reached an agreement with the Federal Trade Commission to stop advertising its Frosted Mini-Wheats cereal as some kind of magical brain booster that would make kids smarter. But it’s taken four years for that issue to finally be put to bed after finally reaching a $4 million settlement in a class action lawsuit related to the same advertising. In the ads and packaging of yesteryear (or 2009, same thing) the cereal had claimed it had been “clinically shown to improve kids’ attentiveness by nearly 20%.” That turned out to be not so true, and the company received a big old slap on the wrist from the FTC. The ads are long gone, but the class action lawsuit had remained, until this week. Kellogg announced it’ll pay $4 million to consumers to settle the suit that said Frosted Mini-Wheats shouldn’t boast improved attentiveness, memory and cognitive functions in children. A proposed settlement has been reached in a lawsuit involving Kellogg, the company that makes Frosted Mini-Wheats. 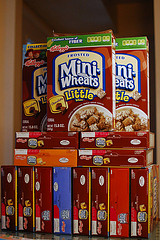 The Lawsuit claimed that Kellogg falsely advertised that its Frosted Mini-Wheats cereal improved kids’ attentiveness, memory and other cognitive functions to a degree not supported by competent clinical evidence. Kellogg stands by its advertising and denies it did anything wrong. The court will still have to approve the settlement. If it does, consumers may seek reimbursement of up to $5 cash per box, with a maximum of $15 per customer.